There is a very good article over at GottaBeMobile by Rob Bushway that compares the Lenovo ThinkPad X300 to the Lenovo ThinkPad X61 Tablet. Before you say “they are two different form factors and two different price points”, yes they are indeed very different design wise and very different in price. That said, many of us have easier access to the ThinkPad X61 than we do a ThinkPad X300, at least for now. 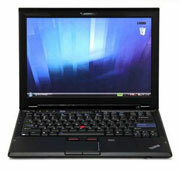 Some of us, if the price was dropped, might even like to see the X61 evolve into a widescreen like the X300. Given that the X300 is a 13.3″ widescreen as opposed to the X61 being a non-widescreen 4:3 type of notebook, this comment by Rob was interesting: Feels almost 25% lighter than the X61. He’s posted several pictures of the two ThinkPads side by side and on top of one another. This entry was posted in LED Backlighting, Lenovo, Tablets. Bookmark the permalink.